Hundreds of thousands of homes have been left without power as Portugal has been battered by one of the strongest ever storms. 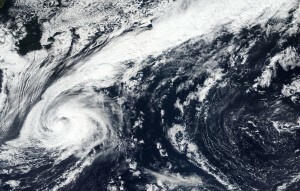 It has been dubbed as a ‘Zombie’ storm because it meandered through the Atlantic Ocean for several weeks. Spain is also expected to be severely battered, the ‘zombie’ storm was first formed on 23 September has meandered through the Atlantic for weeks. Officials had warned not to go outdoor as winds of 110mph were recorded as the hurricane. This further weakened slightly into a pots-tropical cyclone and swept into northern and central Portugal overnight. So far 300,000 homes were reported to be without power and many flights to and from Lisbon were cancelled. But there were no reports of deaths or injuries as yet. The highest level warnings were issued by the Portugal’s weather service for high winds or dangerous coastal conditions for 13 of its 18 mainland districts that included the capital Lisbon. Portugal’s national protection agency Luis Belo Costa asked citizens to avoid walking on the streets.Ever since 1842 the storm is expected to be the most powerful to hit Portugal. Earlier an intense rain caused flash floods in Majorca that killed 12 people including two Britons. Before making a landfall Leslie was downgraded to a tropical storm and it is unusual as hurricanes causing destruction in the American side of the Atlantic brings destructive forces to Europe. As per the weather records Hurricane Vince has made landfall on the Iberian peninsula over the last 176 years, hitting southern Spain in 2005.